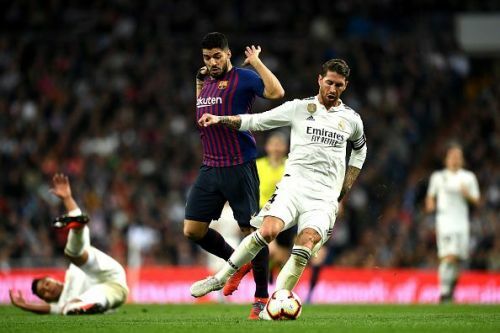 Real Madrid captain Sergio Ramos answered several questions on his social media, accepting responsibility for his mistakes and for Los Blancos' poor campaign. Four successive home defeats in all competitions saw Real Madrid's hopes for a major silverware crash down in the span of two weeks. Two of those four defeats were a 3-0 defeat against Barcelona in the Copa del Rey and a 4-1 loss against Ajax in the Champions League, knocking Los Blancos out from the respective competitions. Their Champions League elimination was more shocking as even after securing a 2-1 win against Ajax in the first leg, Madrid failed to qualify for the quarterfinals. Sergio Ramos had to witness the debacle from the stands due to a suspension for a deliberate yellow card. Last night's 4-1 win against Real Valladolid was Madrid's first win in their last five games, which leaves them 12 points behind league leaders Barcelona. Moreover, there are reports in the Spanish media filled with clashes between Sergio Ramos and club president Florentino Perez, questioning the harmony of the squad. Sergio Ramos expressed his feelings on his social media accounts as he answered many questions regarding the recent occurrences. "Absolutely it was an error and I take the blame 200%." Ramos wrote as quoted by AS, answering whether his yellow card in the first leg was a mistake or not. "Dressing room issues are discussed and resolved in the dressing room. There's no problem whatsoever and everybody has the same interest: Real Madrid." "We have exchange in every training session. It's part of working with pressure. But it’s just an anecdote like so many others that happen from day to day. Marce is like a brother to me." With very little to play for this campaign, Real Madrid will host Celta Vigo next in the La Liga.